Posted on September 28, 2016 at 11:12 am. Just as we’re still trying to get our heads around how impressive it is that Slots Million has its own virtual reality pokies lounge, Gambit Gaming has unveiled plans for an even more mind-blowing virtual reality gambling experience. Under a recent collaboration with Phosphor Games, Gamblit will be taking shooter style VR video games to the gaming floors of land based casinos, bringing real money gaming to a whole new dimension and a new generations of punters. The aim is to make land based casinos more appealing to younger players who are more interested in interactive video games than they are table games or electronic pokie machines. 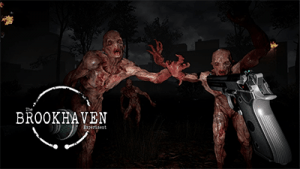 The first video game to undergo this interactive enhancement will be The Brookhaven Experiment, which is a virtual reality shooter style video game that’s currently compatible with the HTC Vive VR headset. The Brookhaven Experiment has had over 50 million views online, with players falling in love with the games suspenseful, creepy undertones, where the aim is to tackle some pretty intense monsters in order to save the world from imminent ruin. Once the Brookhaven Experiment has undergone Gamblit’s enrichments, it will be able to accommodate real money wagers, where players can bet on things like whether or not they think they’ll survive the next zombie attack. It will be the first game of its kind, and is expected to become available within land based casinos in America in 2017. California based Gamblit Gaming will introduce the real money wagering version of The Brookhaven Experiment at the upcoming Global Gaming Expo (G2E) in Las Vegas next week. Whether or not Aussie casinos will see the introduction of virtual reality games remains to be seen. Gambling on shooter style video games has become a hot topic after anti-pokies renegade Senator Nick Xenophon urged for a crackdown on video game gambling, calling for first-person shooter games to be reclassified under law as gambling. While we wait to see what The Brookvale Experiment gambling experience has in store, you can try playing virtual reality pokies for real money at Slots Million where new players can claim a $100 welcome bonus with 100 free spins to use on popular NetEnt slot games.